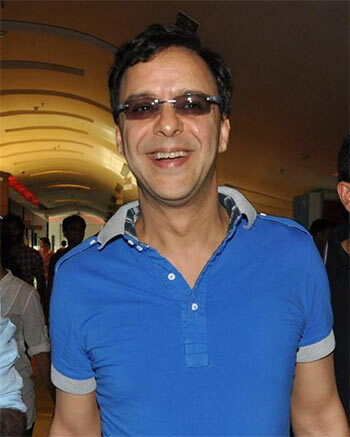 Vidhu Vinod Chopra takes stock of his Bollywood career and explains why he thought of foraying into Hollywood. Vidhu Vinod Chopra is a successful Bollywood director whose films Parinda, 1942: A Love Story, and Mission Kashmir received critical acclaim. His productions like the Munnabhai series, 3 Idiots and PK, have been humungous successes. Chopra is given to making sweeping statements and though loved by many, is also feared for his temper. Now, he has fulfilled one of his life's major desires -- to make an English language film in Hollywood. By all accounts Broken Horses is a small project, far smaller than the films Chopra has produced. It will release on April 10 in the US and India. Rediff.com Contributing Writer Aseem Chhabra met Chopra at the Four Seasons Hotel in New York where the producer spent the day talking to the media. Broken Horses, he said, had received a positive response at the two press screenings in Los Angeles and New York. In Mumbai, there was a secret screening of the film organised by Star Movies for Twitter influencers. "I'm told it's trending," he says. "This is a good thing, because it is the first time for me." Why was it important for you to make a Hollywood film given the kind of success you have had in India? Broken Horses was a huge challenge. I learnt my ABC when I was 16 years old. Abhijat Joshi and I are writing an English script for Hollywood. No. I can speak it because I watch Hollywood films. I learnt to speak from watching movies. But my English is not half as good as my daughter's who is 13 years old. Your wife (Anupama Chopra) is a journalist and she writes in English. Woh to hai, par main nahin( she may do so, but not me). Even now I read Hindi books much faster than English ones. I went to a vernacular DAV school. So for me, the whole idea that we could do it was madness. I could have made a fool of myself. My nightmare is that people will say this is Bollywood-comes-to-Hollywood, that it is over-the-top. Alfonso Cuaron said something amazing. He had seen 1942 A Love Story. I have seen his quote. If a mathematician or a scientist comes here, they use the same stuff they know in India. But English language films and our Hindi movies are completely different art forms. Shekhar Kapur has been able to do it although some would say the second Elizabeth is quite Bollywood-ish. Shekhar had a script and he was hired to direct the film. This (Broken Horses) is the first time an Indian has written a script, produced and directed it for a Hollywood film. And it is my vision. I read you wanted to make The Fifth Move. That became a Hindi film. The film I am now doing with Farhan Akhtar and Amitabh Bachchan is The Fifth Move. It didn't happen because the producer Bobby Newmyer, who was working with me, died suddenly. Image: Manisha Koirala and Anil Kapoor in 1942: A Love Story. A story I want to tell. What is it that made me make Broken Horses? Is it that I want more glory? I have enough glory. If anything, my company has lost immensely because I put four years of my life into making Broken Horses. I could have made another Hindi film and made a few hundred crores. But PK was shot at the same time. PK took five years and this it is all we have done. So I made two films in five years. I am trying to understand the attraction of Hollywood for some Indian filmmakers and actors. Is it a question of acceptance? I don't seek acceptance here, or an Oscar. To me, an Oscar is a little less rackety than a Filmfare award. When Jennifer Lawrence won over the older woman (French actress Emmanuelle Riva in Amour), I lost respect for the Oscars. It was one of the finest performances of all time and they should have given it to her (Riva). Maybe it is less of a racket, but it is still a racket. And money has never driven me. I am sure you have enough money. Hell of a lot! Every film I have made was a success. I thought Kareeb and Eklavya lost money. No. Not for me. Eklavya did very well. Image: A scene from Broken Horses. Why did it take you four years to make Broken Horses? How long did it take you to shoot it? Thirty-three days. It took a long time to write. That was a tough thing for Abhijat and me. As we were writing, we would send it to Vikram Chandra (the novelist and Chopra's brother-in-law). He would rubbish it and tear it up! To actually write in English for a world audience is not easy. Were you bringing your Hindi film sensibilities to your writing? No. I wanted to say two things about family and brothers. I travelled for six months. We hired a car and went to Arizona, California, and along the Mexico border just to get a feel of the land. I stayed for a long time in a place called Lordsburg (in New Mexico) where I did a lot of writing. So essentially this is the story of Parinda? Yes, it started like that. We were going to Boston in a train for the screening. We had both seen The Departed and I told him the original film (Infernal Affairs) was much better. I couldn't understand why people where praising Departed. Abhijat said, "Chal, let's adapt Parinda." And I agreed. So it really started as a joke. But the characters of the brothers are quite different. Oh yes, Parinda and Broken Horses are very different. Our idea was to take off on Parinda. But I think this film has gone somewhere else. We wrote the whole film set in New York. Nick Pileggi, who wrote Goodfellas, came on board as a consultant. I went to the Rockefeller Center and conceived one killing there. But one night, as Abhijat and I were walking, I looked at all these avenues and I realised I did not know my way around here. In the morning, we decided to take it into the elements -- use fire, water, earth, desert, sun. And that is how it went to the Mexican border. Parinda was an iconic film -- one of the first that looked at the Mumbai underworld in a realistic manner. Is Parinda the most important film to you? No, I don't think so. I liked Lage Rahe Munna Bhai the most. But among the films you directed? I liked Eklavya the most. At this moment, of course, I like Broken Horses. For me, it is an achievement to have made it. How different is it making a film in the US? I just met Amitabh (Bachchan) before I left and he asked, "Aur kitne din hai shooting ke (How many more days of shooting)?" I told him "Bus ek hafta yaan dus din aur (another week or 10 days)." In India, we shoot for 100 days, 120, 140 days. Here it is 33 days. Everyone works 9 to 6. What about working with the actors? It is very different. I often spoke Hindi on the sets. I used to abuse in Punjabi. Vincent D'Onofrio understood the Punjabi abuses. When my wife asked him, "How was it working with Vinod?" he said that an American director would just say, "Do it again," but Vinod says, "You s****** it. You f***** my shot." You abuse a lot on the sets? You have a reputation for losing your cool. We all saw you burst out with anger at the 3 Idiots press conference. Yes, I get angry at mediocrity. When I finished Broken Horses, Abhijat Joshi said, "Sir, do you realise you didn't lose your temper once?" That is because everything was efficient. What annoyed me at the 3 Idiots press conference, when I said shut up, was that this guy (a reporter) had not read the book. He had no idea what I was talking about. What about Chetan Bhagat (the author of the book on which 3 Idiots is based)? Forget Chetan. I am talking about that journalist. Mediocrity annoys me. I push myself. Why did I make Broken Horses outside my comfort zone? James Cameron raved about the film. He asked me, "How can you do it Vinod? How did you come out of your comfort zone?" Someone asked this morning on a radio interview, "How did James Cameron praise you? He is a mean guy." I said, "He's not a mean guy. Even I am supposed to be a mean guy. But I am not mean." I am 62. But I don't feel 62. How long are you going to keep working? You don't want to retire? Never. You retire from what annoys you that you do for a living. How can you retire from your passion? 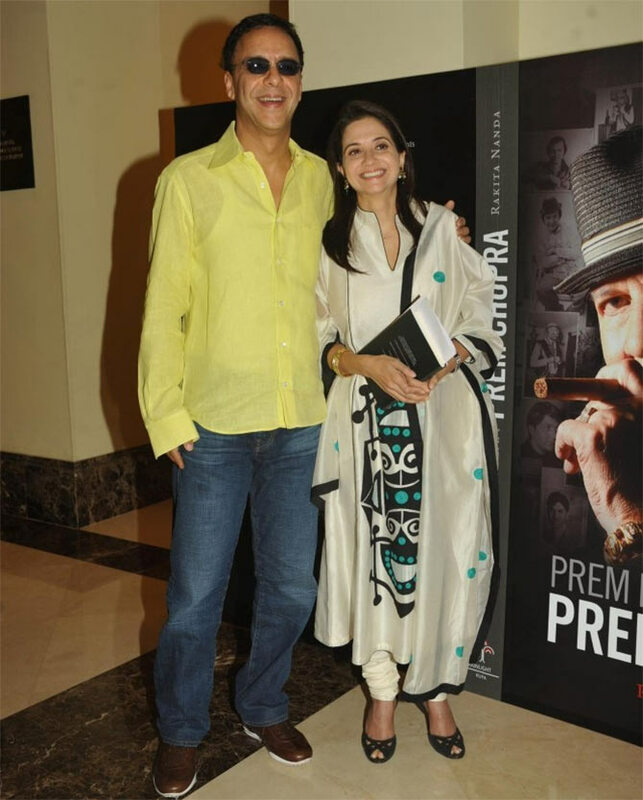 So what does Vidhu Vinod Chopra do next? I don't know. I am confused. There are offers from studios in America. I am going to Los Angeles to see. I don't know if I can function within the studio system since I have been independent all my life. In India, I am trying to write a script on the Kashmiri Pandits called Pachisvin Salgira. If that works out, I will do it. 25 years of Pretty Woman!